We understand that weddings can be overwhelming and dancing can be scary. We have compiled a list of our most popular asked questions with insights and solutions to help you choose the right dance studio in Chicago. This guide can help you select dance classes best suited for you. Do you have a question we didn't cover? No problem you can send us a message. Windy City Wedding Dance is a popular local Chicago dance studio where you can take dance lesson for your wedding. The dance studio has multiple locations which include Downtown Chicago, Lincoln Park, Naperville, and Schaumburg. In our dance studio the average number of dance lessons couples take for a wedding is 6 dance lessons. In our dance studio the average couples spend on dance lesson is around $500. The best dance studio near downtown Chicago for Wedding Dance is Windy City Wedding Dance. Our full service dance studio services brides, grooms, single adults, or couples. In our dance studio couples book their dance lesson 3-6 months in advance on average. 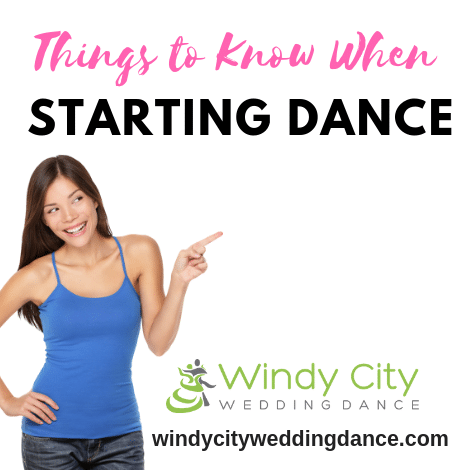 It's important to start early so you are most comfortable and natural during your wedding dance. In our dance studio the most popular dance styles used for a wedding is Foxtrot, Rumba, and Night Club 2 Step. The song that a couple chooses should be evaluated during the first dance lesson. The instructor should demonstrate and dance multiple dance styles with the couple so they can choose which dance style best suits them. In our dance studio we have an online booking system. This can be done from a desktop or mobile device. If you need back up and more information about a local dance studio check out the reviews and what customers are saying. The best customer service is human interaction. Pick up the phone and get to know who you might be working with for your first dance.